iPage is one of the many hosting brands of the Endurance International Group (EIG) and they currently rank among the top of many popular review websites, including Consumer-Rankings.com, Hosting-Review.com, and more. With that kind of reputation, and offering hosting at the lowest price you will find anywhere, you can’t possibly go wrong with iPage, right? The short answer to that question is yes, you can go wrong with iPage. In my opinion their business practices are questionable at best. They take advantage of customers who are not very knowledgeable about web hosting and care less about providing a good service than they do about the money. Yes, every web host is in business to make money, but there is a right and wrong way of going about this. $1.89/month for hosting, holy cow! That’s great! Sure, it’s great for now if you don’t plan on renewing. But look a little bit deeper and you’ll find out how they can offer web hosting at such a cheap price. Their “any time” money back guarantee is a pretty good gimmick too. Yes, they offer you the ability to get your money back at any time. Let’s just review their terms about this any time refund. A $35 early cancellation fee? Really? Time for some math. Say you sign up for a 2 year account, which totals $45.36. After 6 months of hosting you decide you want to cancel, which entitles you to a $34.02 prorated refund. By that logic you owe them $0.98 to cancel your account? Some guarantee that is. iPage does offer pretty good features. 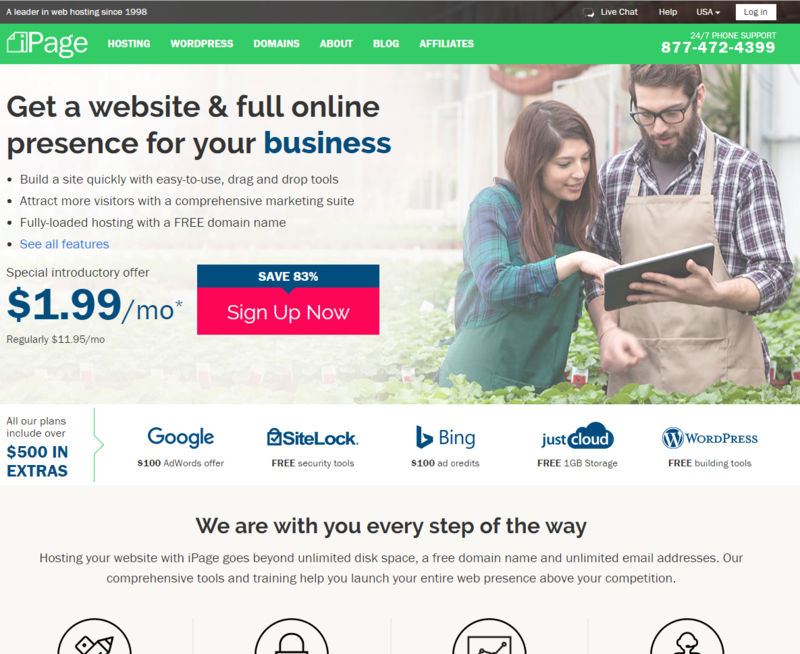 They are on par with the other shared hosting companies as far as the “unlimited” disk space and bandwidth offer, free domain name, free site builder, etc. The problem I have is the way they try to show these as extra value added to your account that you’re getting for free. They claim that these features add up to $500 in added value to your account. How are they making money on all this? 1. Their “$50 value” design suite means nothing. It just throws out words like “blog” and “photo gallery” like those somehow cost extra money to use. Last time I checked WordPress is free so that makes no sense. 2. Their SiteLock $100 value. Yes, you do get a SiteLock security seal. Guess what? SiteLock is also owned by EIG, the same company that owns iPage, so it’s no cost to them to add this to your account. 3. Their Marketing suite of $300. Google, Yahoo, and Facebook all give out thousands of coupons for web hosts to use for free so that they can generate more revenue. This costs the web host absolutely nothing. 4. Their “$50 support suite” is something that you should expect for free from any web host you choose. I don’t understand how they get the idea that this should be a $50 value. Yes, the features they offer are pretty good. They actually have a lot to offer as far as a shared hosting account goes. But iPage tries to market it as if they are giving you all these things at a cost to them when in reality it’s nothing that any other host doesn’t offer. There isn’t anything special about iPage’s feature list. This is quite possibly iPage’s biggest draw back. Sure, they can market however they want to try and get customers. My opinion about how they operate might not be shared with the rest of you. But the biggest issue with their $1.89/month pricing is that they have to fill their servers more than other hosts to make up for the price difference. While my uptime is fine enough, 99.3%, the speed at which my test site loaded was not acceptable. The problem with packing servers as full as possible is that more customers are sharing the same resources. Think of it as a highway. If there are only a few cars sharing the road then they aren’t slowing each other down. However, put thousands of cars on the same road and you get traffic jams. The same concept applies with shared servers. If you put too many people in the same place then they are all going to slow each other down. Uptime is only one aspect of reliability. What good is having a website be up if it takes ages to load? Like I’ve said a couple of times already, iPage is owned by EIG, who owns over 50 other web hosting companies. iPage shares support representatives with other brands of EIG, so when you try connecting to a live chat you have to explain what brand you host with, wait for them to pull up the system for that host, and then get started. This also means that support reps really only have a general knowledge of things since they have to support so many different companies, all with different features. The other problem I have is that the support is outsourced. I’m not going to argue about whether outsourcing is good or bad. That argument is pointless here. I do expect to be able to have a coherent, competent conversation with someone if I am asking questions about a service that I am paying for. While some of the techs are decent enough, I had multiple instances where I was fighting through broken English to get answers to questions. For a beginner I can imagine this would be too frustrating to put up with. Yes, this review is largely based on my opinion on how iPage operates as a company (other than the reliability issues which are based on testing). I’m sure plenty of people think it’s not as big of a deal as I do. I just hate seeing a company like that get so much business when they are so indifferent to their service and treating their customers with respect. I would suggest choosing a different company to host your website. This review may have caught you off guard because of how often you see iPage at #1 on other review websites. This is because iPage pays out a lot of money to these sites to keep them at the top spot. You can read more about that on my How Affiliate Programs Work page.